Amanda* defends health professionals with tenacity and sensitivity. When facing an investigation or a lawsuit, Amanda’s clients can count on advice that gets to the heart of the matter. As an advocate, Amanda acts§ with purpose to cut through the noise and identify practical solutions, keeping in mind the unique interests of each client. With a keen understanding of the legal issues that arise for healthcare practitioners, she litigates with integrity‡ in every case. Her strategic advice and sound arguments get results, allowing her clients to get back to the business of patient care. .
Amanda is a litigator with a focus on healthcare. She has acted for professionals in a range of sensitive and complex matters before disciplinary and regulatory tribunals, and before all levels of court in Ontario. She has also presented in continuing education programs for healthcare providers, providing practical advice on how to reduce the risk of complaints and litigation in professional practice. Amanda graduated from Osgoode Hall Law School in 2010, having received several awards and honours during her tenure. She also carried client files at Parkdale Community Legal Services; served as a Junior Editor for the Osgoode Hall Law Journal; and completed an independent study project on the causes of wrongful convictions. 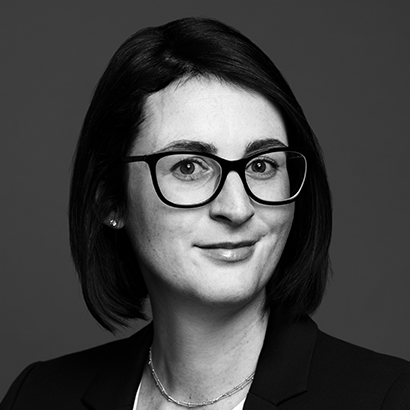 After law school, Amanda served as a law clerk for the judges of the Ontario Divisional Court and the Superior Court in Toronto, gaining early exposure to the way judges think about and apply the law. She went on to use these insights as a litigator with a leading insurance defence firm in Toronto, defending professional negligence and malpractice claims, regulatory proceedings, human rights complaints, and related appeals. Amanda also gained experience defending occupiers’ liability, commercial, and tort motor vehicle claims.